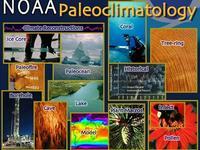 The National Oceanic and Atmospheric Administration's (NOAA) Paleoclimatology Program, located at the National Geophysical Data Center (NGDC), helps the world share scientific data and information related to climate system variability and predictability. Their mission is to ensure the international paleoclimate research community meets the scientific goals of programs including the International Geosphere-Biosphere Programme PAGES (IGBP PAGES) and the World Climate Research Programme on Climate Variability and Predictability (WCRP CLIVAR). This site includes a section on Research Programs, including information on the scientific goals, reports and publications, extramural program, and scientific conferences. An Education and Outreach section provides background on paleoclimatology as a discipline, paleoclimatology slide sets, information specific to primary and secondary educators, and links to other paleoclimate education programs, including NOAA's own (GLOBE). The Paleoclimate Data section assists users in both data access and submission. Data are available for the following subdisciplines: borehole data, climate forcing, corals, fauna, ice cores, insects, paleoclimate modeling, paleolimnology, paleooceanography, plant macrofossils, pollen, tree ring, and other paleo data. Alternatively, searches for subsets of data can be conducted within all available paleoclimatology data, global climate modeling (GCM) boundary conditions, paleocean data, paleoclimate model output, pollen data, or tree ring data. Other site features include a What's New section, Paleo Perspectives, a general link list (Places of Interest), a Paleo Visitor Program, an Address Exchange and Discussion List, and an area in which to download Free Software useful in paleoclimate research.